Active learning begins around the time your child turns 2. 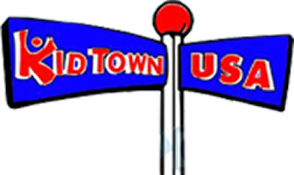 Kid Town USA in Clinton Township, Michigan, offers a special program for toddlers that develops this interest in learning. We utilize art, music, science, and other popular subjects in order to further their grasp of learning and provide them with the skills necessary to perform well later on. Our toddler program follows the state-mandated ratio of 1 caregiver to 4 children. Upon becoming a toddler, your child will enter the wonderful world of active learning, our basic curriculum program. In an active learning program, your child is provided with a wide variety of materials for learning. 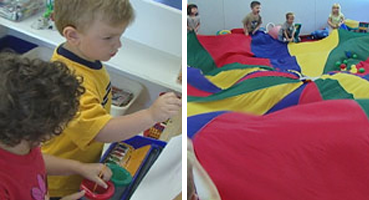 He or she is allowed to choose which materials interest him or her in any play period. He or she is also observed by the teacher who regularly joins them in play, recognizes his successes, and challenges him to explore, learn, and create. Active learning is supported by a daily schedule, which includes playtime, group time, outdoor time, meals, and rest periods. During group time, teachers and children explore a wide range of subjects, including books, music, finger play, colors, and numbers. When a teacher notices particular interest in an idea, she will develop that interest using the project approach to learning. Children will have time outside twice daily unless the weather is inclement. On these days, children will be taken to our "Town Hall", a room designed to allow children to use their energy, even on bad weather days. We are required by the State of Michigan to provide outdoor play unless the temperature and wind chill are at or below 17 degrees. At 2 1/2 years old, your child will enter our transition program. This program focuses on potty training and preparing your child for our preschool program. As we help him or her gain the independence needed for preschool, your child will continue to have a daily schedule that will include art, motor activities, and sensory experiences. This program also further develops social skills by providing social experiences through free play and group activities. Our transition program follows the state-mandated ratio of 1 caregiver to 8 children.